LATEST: Russian investigators are now treating the Crimea college attack as murder, not terrorism, and say at least some victims appear to have died of gunshot wounds. They say the suspect is an 18-year-old student. 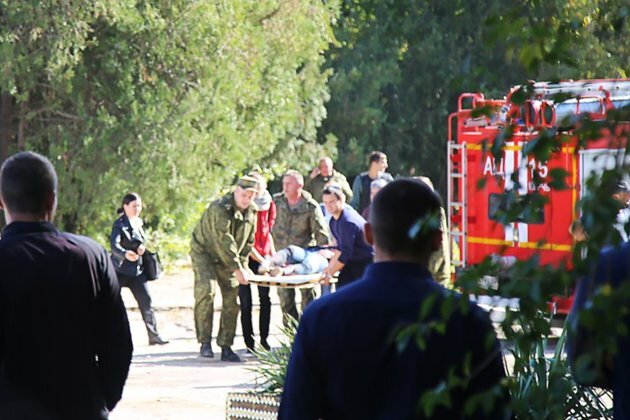 Russian authorities say a bomb filled with shrapnel exploded at a college in the Crimean city of Kerch, killing 18 people -- mostly teenagers -- and injuring dozens in what investigators said they were treating as a terrorist act. The Russian-imposed head of Crimea said the suspect was a 22-year-old student at the college who killed himself sometime after setting off the blast. The explosion ripped through the cafeteria at a polytechnic college in the city on the eastern end of the peninsula that Russia seized from Ukraine in 2014, Investigative Committee spokeswoman Svetlana Petrenko said. State news agencies cited the Russian National Anti-Terrorist Committee (NAK) as saying it was caused by an unidentified explosive device, and Petrenko said the bomb was packed with metal objects. She said that officials were aware of 13 dead and about 50 injured people, most of them teenagers, but Aksyonov later said the death toll was at 18. Students at colleges in Russia are usually about 14-17 years old. Several news reports and a video purporting to show the distraught director of the college indicated that assailants fired guns in addition to setting off explosives, and depicted a scene of carnage at the college. Emergency workers help the wounded after an explosion at a school in Kerch on October 17. Unless authorities determine that the suspect was acting alone out of some personal motivation, the incident is likely to increase tension between Russia and Ukraine, which Moscow has accused in the past of seeking to carry out acts of sabotage in Crimea. The regional Emergency Situations Ministry declared a state of state of emergency in Crimea and said security was being increased. A three-day mourning period was announced by the Russian authorities who control the Black Sea peninsula. The woman, speaking on a mobile phone, said that shortly after she left the college for a meeting elsewhere, assailants attacked the school, throwing explosive devices and firing guns. 'They ran up to the second floor with automatic rifles -- I don't know with what -- and opened doors...and killed everyone they could find,' she said, seeming to choke back tears at times. She said students and faculty members were among the dead. The authenticity of the video could not immediately be independently confirmed. Some earlier reports had quoted officials saying it was a gas explosion, but a spokeswoman for the regional gas-distribution company said it had no contract to supply gas to the school. Eyewitnesses said ambulances and other emergency vehicles rushed to the site after the blast, which some reports said took place in a cafeteria. Kerch is the site of the western end of a newly built bridge linking Russia to Crimea, which it took over by force after Moscow-friendly Ukrainian President Viktor Yanukovych was pushed from power by pro-European protests in Kyiv. Russia sent troops to the peninsula, secured key buildings, and staged a referendum denounced as illegitimate by Ukraine, the United States, and a total of at least 100 countries.